That's me having a snooze under Mom's desk. I'm kind of doing that now, Mom just dropped her keyboard under the desk for me. I think she loves me. Puppy also currently can't get here. He's not as mobile as he wants to be. The towel is there for me to rest my head on, and so Puppy doesn't knock his brains out if he falls against the leg of the desk. 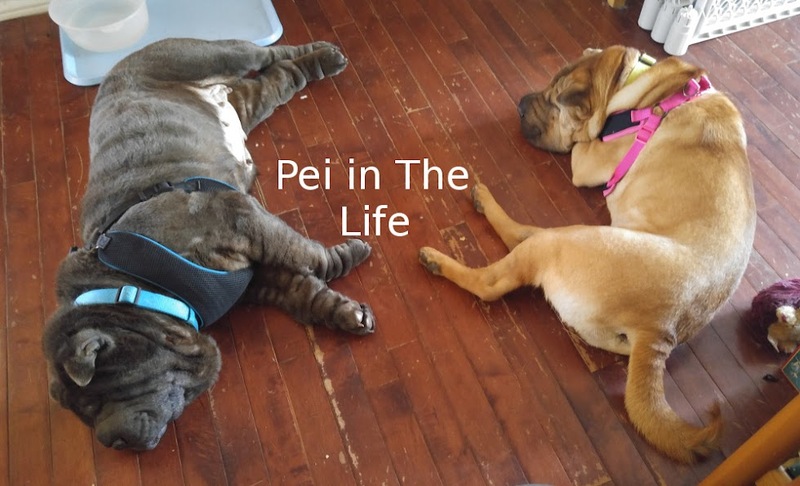 Anyway, Miss Lola Shar Pei asked me a kind of personal question, which I really don't mind talking about here because it leads into a funny/nice story about my brother Shih Kwan. When you have time, can I ask you a sort of personal question? It's about marking. I was wondering if you ever had that issue and if so does your Mom have any tips about it? Well Miss Lola, I'm not big on marking my own house, but I have been known to mark my cousins beds when we go and visit them at Granny and Bionic Grandpa's. That's the extent of my marking. Mom and Granny have learned to catch me doing it and they go No no Bolo and push my leg down. I'm usually ok the second day and don't try and mark anything after that. My Brother Who Came Before, Shih Kwan, did some interesting marking. Mom and Dad didn't find out about this until after he had crossed the Rainbow Bridge, which makes it a little funny because he was almost 7 years old and everyone else in the family knew about it. See, Bionic Grandpa has a weight bench in the basement of his house, we normally sleep in the basement of their house because that's where the guest rooms are. Anyway, Mom and Dad used to leave Shih Kwan with Granny and Bionic Grandpa when they'd go and visit Toronto, which was usually two or three times a year. Well, little did Mom, Dad and Bionic Grandad know that when Shih Kwan was left behind like that, he'd go and mark Bionic Grandad's weight bench, just to let Bionic Grandpa know that another dominant doggie was in the house. Everyone knew this is what Shih Kwan would do, except Mom, Dad and Bionic Grandpa. Bionic Grandpa would ask, "Why are my weights getting rusty?" and Granny and Shih Kwan would giggle together because they knew why. Here's a Shih Kwan picture to keep you going. That was a pretty good story, Bolo. Also a very nice photo of your predecessor. I'm glad my question reminded you of him. that's a funny story. :) i think my mama wouldn't be as amused if i did that, unfortunately. i think my mama must be a little square. heehee.